QNAP Turbo NAS is more than just storage. 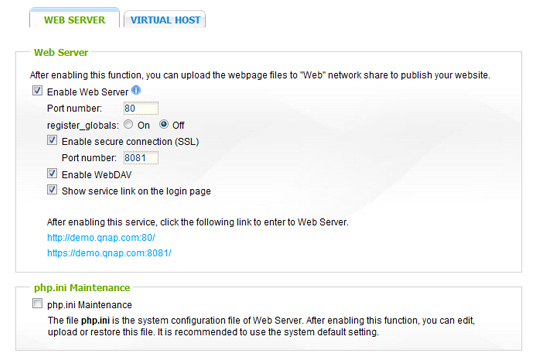 It also provides useful business applications, including web server and printer server. 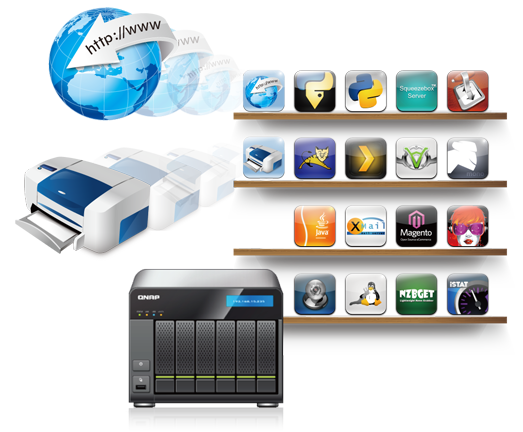 Besides, various QPKG software packages available in the QNAP QPKG Center enable flexible and wider online applications. The Turbo NAS performs as a well-rounded system to fulfill smooth business operations with low total cost of ownership. In this digital era, building websites has become one of the most direct ways for businesses to communicate with customers in a timely manner. Instead of investing precious time and effort in relevant IT setup procedures and cost in hardware purchase, the Turbo NAS provides a great alternative with simple setup process, helping build up business websites easily and quickly, in just one place. Thanks to the “virtual host” feature, up to 32 websites can be hosted in a single Turbo NAS, helping minimize IT expenses. The built-in web server, together with PHP/MySQL support, allows running famous web applications on the Turbo NAS and hosting websites such as Joomla online shops, phpBB forums, or online marketing platforms very easily. 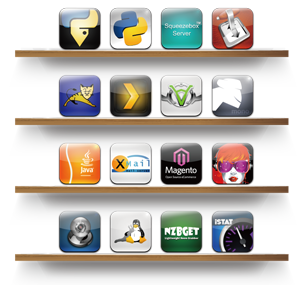 A variety of 3rd-party open source apps are available to be installed based on business needs. In business environments, sharing the printer connected to a certain workgroup member’s computer can be inconvenient. That means, the member’s computer has to be on all the time. Good news is, the Turbo NAS can play the role as a printer server. 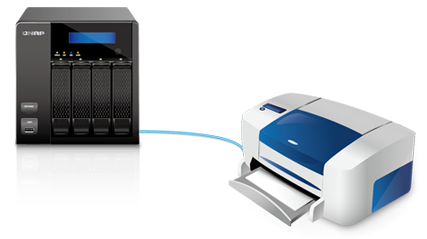 By connecting a compatible USB printer to the Turbo NAS, members can use the cross-platform printer resources over the network and send remote printing request over the Internet (max. 3 USB printers) without interrupting each other’s work. It supports IPP (Internet Printing Protocol), Samba, print job management and Bonjour printing for Mac OS X. As the Turbo NAS acts as a printer server and becomes the hub to manage cross-platform printing requests from numerous users, it is also beneficial for IT administrators to centrally control the printer resources in terms of access permission or printing tasks management. For example, IT administrators can allow or restrict the use of printers from certain IP addresses or domains, making sure the printer is dedicated and used by the right department members to prevent resource overload. The Turbo NAS supports features expansion by installing additional QPKG software packages developed and shared in the Linux open source community. The QNAP QPKG Center incorporates numerous QPKG packages listed by categories, including business, content management system, communication, download, entertainment, utilities, and so forth. All the QPKG packages can be installed and run right away with just one click. Have great QPKG package ideas to share with the QPKG community? Great resources on developing QPKG packages, including tools, documentation, and sample codes, are available online.